Meets the AAMI-recommended level of less than 0.5 ppm chlorine in rinse water for dialysis machines and equipment disinfected with chlorine bleach or similar chlorine-based disinfectants. 3. Proper Mechanisms for Assuring Disinfectant Concentrations for Use in Hemodialysis, Nephrology News & Issues, June 1999, pg23. 4. AAMI Standards and Recommended Practices, Dialysis, 2008 Edition, RD62 - Water treatment equipment for hemodialysis applications, Association for the Advancement of Medical Instrumentation. Arlingston, Virginia. 5. NANT Dialysis Technology - A Manual for Dialysis Technicians, 2nd Edition (2000), page 255. National Association of Nephrology Technicians/Technologists, Dayton, OH. 6. Proper mechanisms for assuring disinfectant concentrations for use in hemodialysis. Nephrol News Issues. 1999 Jun;13(6):18, 23, 27. Arduino MJ. Use Serim GUARDIAN Residual Chlorine Test Strips to test rinse solution from the drain line of the hemodialysis machine or appropriate sampling points of the bicarb mixing tanks or jugs and water systems. Use Serim GUARDIAN Residual Chlorine Test Strips after rinsing the bleach solution from the hemodialysis system and prior to initiating dialysis. 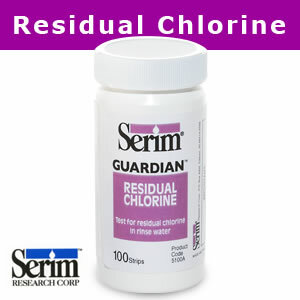 Serim GUARDIAN Residual Chlorine Test Strips are supplied in ready-to-use form. The strips can be used as a quick, qualitative screening test; detecting concentrations of bleach above or below the 0.5 ppm AAMI action level. The strips can also be used as a semi-quantitative method to estimate chlorine concentrations between 0 and 5 ppm. When placed in contact with the sample according to the directions for use (see below), the indicator pad changes color relative to the concentration of chlorine. Sample Preferably test the rinse solution at the drain. Collect a sample of rinse solution from the drain. Test Strip Technique Hold the indicator pad in the rinse stream for 5 seconds. Immerse the indicator pad into the sample of rinse solution and move the strip back and forth vigorously through the sample for 30 seconds. Results Any color indicates a residual chlorine concentration of 0.5 ppm and above. Remove the strip from the sample and within 10 seconds compare the color of the indicator pad to the color blocks on the bottle label. Store bottles of Serim GUARDIAN Residual Chlorine Test Strips at temperatures between 15°- 30°C (59°- 86°F).